A lot of people wonder, why some football viewing centers are always filled with people, is it that they cannot afford to buy a cable TV and watch in the comfort of their homes? The answer is that over 60% can watch those live matches live inside their living room but prefer to watch it at a viewing center because it is much more fun and enjoyable. Infact when it comes to watching live football match, some Nigerians are ready to spend their last cash. During the weekends, there are always a lot of matches, there are also midweek matches, although not every week. 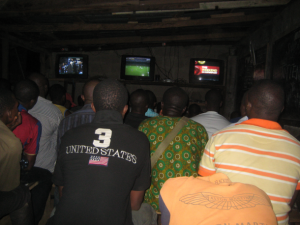 The cost of viewing a match in most places in Nigeria is low, most times its N100. Imagine if you start this business and your viewing centre is sufficiently spacious enough to accommodate 100 people, you will stand to make roughly N10, 000 per match. In situations where there are matches at various time, say; Arsenal vs. Chelsea 1 pm, Man united vs. Liverpool 4 pm, Barcelona vs. Real Madrid 9 pm. That will mean a sum of N10, 000 multiply by 3 = N 30,000 on a single day. Isn’t that a good small scale business? The talk about getting a good location is basically no news when starting a business. Because it’s a must for most business if not all. Get a decent and well-spaced area for your viewing centre .It could be a shop or a field. If it’s an open space like a football field, you may have to get a carpenter to make a shed by making use of zinc and ensure that the structure is wide enough to contain a good number of people (say 100 to 500 sitting capacity). Note: Capacity is a key success factor in the football viewing center business. The more people you viewing center can accommodate the more money you will make. If you have a low start-up capital, what you need to do is to get wooden seats. This will minimize start-up cost and will be able to accommodate a significantly large number of individuals. But if you have enough capital, you can opt for single plastic chairs as they are more comfortable. You must ensure that your viewing center is properly ventilated; so as to make your customers feel comfortable. If they don’t feel comfortable watching football matches in your viewing center, then there’s a high chance they will patronize your competitors. I guess you don’t want that. You should provide fans (standing or ceiling) to enable a cooler atmosphere. I would recommend two or three – big – flat screen – coloured televisions with good graphics (HD). A new television with good sound and graphics makes the match more enjoyable. But if you’re working on a tighter budget, you can actually get fairly used televisions with the above qualities. Multiple TVs enable you to give viewers the opportunity to watch any match of their choice when there are different matches going on at the same time. DSTV decoder is the best to purchase as they have right to cover most popular matches all over the world. 5. French Ligue 1 and so on. To be able to watch all these competitions, you need to subscribe to the premium DSTV plan. Because of the epileptic power supply in Nigeria, you must have a standby generator in other to smoothly run this business. Football matches are always interesting that viewers are glued to their TV sets during the 90 minutes of the match. As a result, viewers would always be attracted to a viewing center that guarantees them uninterrupted power supply especially within the 90 minutes of the match. This can only be achieved by having a standby generator. This is used to keep the decoder running in case of power outage. That way, you can easily switch to generator or public power without having to reboot the decoder all over again. Writing boards publicize your viewing center and this will enable you to notify customers of the date and time of coming matches. Get a printed ticket to identifying paying customers. The ticket is a small piece of receipt to certify that a certain customer has paid for the service to be rendered. Another way to earn from this business is to sell food, snacks, drinks, etc. As people watch their favourite team play, they love to wash it down with snacks and cold drink. Most individuals usually come with a friend, girlfriend or relative. Not selling most of these is like hindering the full potential of your business. One of the reason why most people watch football is to know whether the game they played entered or not, that’s is, whether they won or lose. You can set up an account with betting companies like Bet9ja, Bet360, NairaBet etc. so that people can come and buck for games. Matches do not go on every day. They go on at regular during Local Leagues, World cup, Nations Cups and European Football Leagues. Whenever there’s no match, the center can be converted to a gaming center where game fanatics can come and compete with each other, most especially PES. This will earn you additional revenue. Football viewing center is a very lucrative business that can fetch you lots of money if properly managed. This is a business you can run either full-time or on a part-time basis. It doesn’t require much capital to begin and it’s very easy to run. One of the important thing you must do is make sure you treat all your customers nicely to keep them coming. Wow... Such a lucrative business. But will make sense in a location with much football lovers.